Home » Desserts » The Cutest Marshmallows EVER. 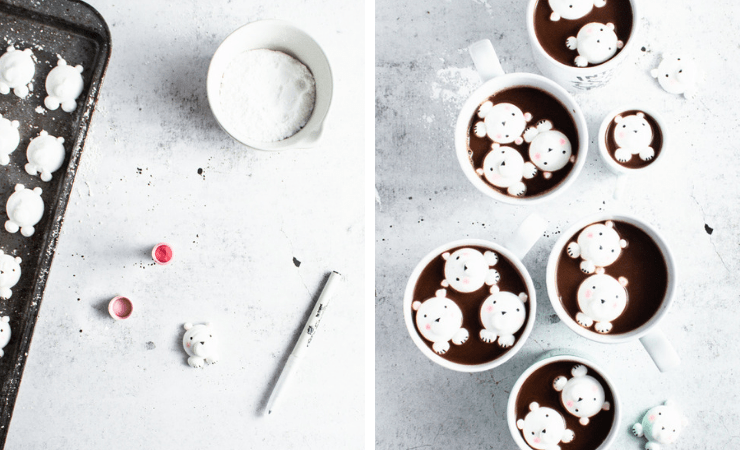 Take your hot chocolate up a notch with these adorable polar bear marshmallows! With this simple marshmallow recipe, you’ll be turning out jaw-droppingly cute marshmallows in no time. 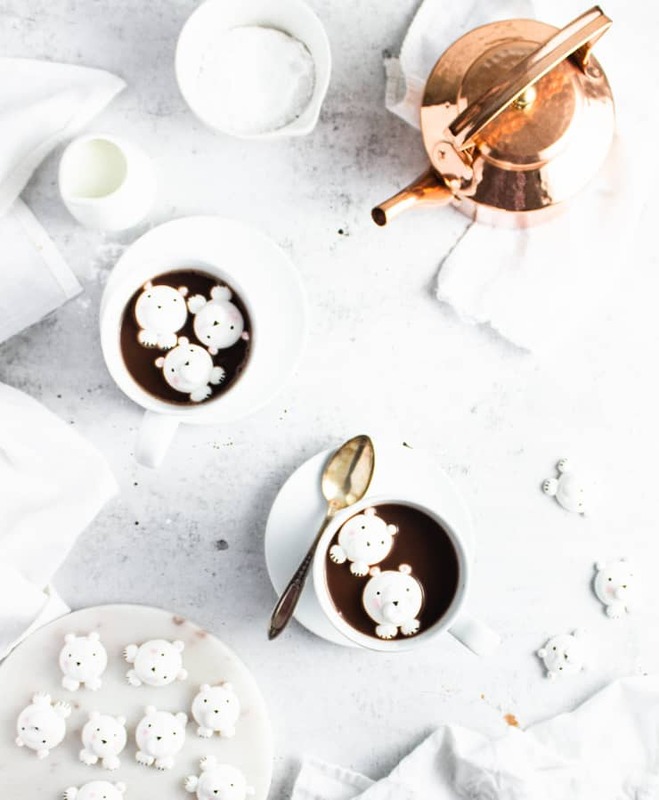 Is there anything better on a cold winter day than cuddling up under a cozy blanket with a steaming hot cup of liquid chocolate? That’s a tall order to beat, I know. But yes, actually, there is. And it involves said cup of delicious chocolaty goodness filled with mind-meltingly adorable marshmallows. And this is exactly the realization I came to when I stumbled across these cat marshmallows online. Need, want, TAKE MY MONEY NOW. Unfortunately the Japanese site that sells these adorable little puffs of marshmallowy goodness no longer seems to be up and running. What’s a girl to do? A girl makes her own adorable marshmallows with a polar bear twist. And so can you! First, make your marshmallow. 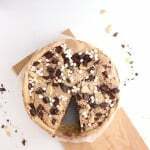 You’ll need to prepare your gelatin, make a sugar syrup, and whip up some egg whites. Add your gelatin to your syrup, combine with your egg whites, and whip until fluffy. Second, spoon your marshmallow mixture into two piping bags (with most of the marshmallow in one bag). Clip a large hole in the piping bag with the most marshmallow and, working quickly, begin piping big dollops for the faces and two small dollops for the feet on the bottom of each face. Pipe all of the faces and feet before going back with a damp finger and flattening down any points. Clip a small hole in the second piping bag and pipe the muzzles and ears. Again, pipe all the ears and muzzles before going back through with a damp finger and pressing down any points. Third, wait for the marshmallows to dry (preferably over night, but at least 8 hours). Finally, coat in the marshmallows in powdered sugar and decorate with a black food marker pen and pink powdered food coloring. Hand piped marshmallows are all about consistency. You’ll want to whip your marshmallow until light and fluffy but still very malleable. You’ve nailed your consistency if you can pick up a spoonful of your freshly whipped marshmallow, drop it back into the bowl, and it reabsorbs in about 20 seconds. 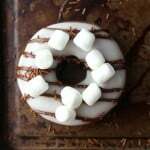 Once your marshmallow is the right consistency, put it in a piping bag and pipe immediately. Marshmallow will slowly firm up, even in a warm room, so you’ll want to pipe your marshmallow immediately. If your marshmallow gets too firm to work with, no worries. You can get it back to the right consistency by microwaving it using 5 second increments. Grease AND dust your parchment paper with powdered sugar to make peeling off those marshmallows a breeze. If your marshmallows have points from the piping, you can gently press them into place with a damp finger. Make sure to do this as soon after piping as possible for best results. After drying overnight, the tops of your marshmallows will still be slightly sticky. 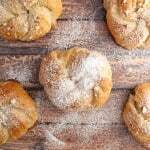 Roll them in powdered sugar until they’re no longer sticky, and then brush them off so the powdered sugar doesn’t gum up your food marker. Storage: homemade marshmallows will keep for about a month when stored in an airtight container in a cool place. 1/4 cup water + 2 tbsp. In a small saucepan whisk together the corn syrup, granulated sugar, and 1/4 cup water. Bring to a boil and allow to cook until a candy thermometer registers 235F/113C. In the meantime, beat your egg whites until they hold soft peaks. Once the sugar mixture reaches the right temperature, whisk in the gelatin (be careful with your hands because it’s likely to release hot steam when you do this) and stir to dissolve. Slowly add the hot mixture and vanilla extract to the egg whites and whip until stiff (about 8-10 minutes). Cover a couple of baking sheets with parchment paper and dust generously with sifted powdered sugar. Spoon the marshmallow mixture into two piping bags putting most of the marshmallow into one (this will be for piping the faces) and a couple of spoonfuls into the other (this will be for piping the ears and muzzle). Clip a large hole in the piping bag with the most marshmallow and, working quickly (the marshmallow will start to stiffen pretty fast), begin piping big dollops for the faces and two small dollops for the feet on the bottom of each face. Pipe all of the faces and feet before going back with a damp finger and flattening down any points. Clip a small hole in the second piping bag and pipe the muzzles and ears. Again, pipe all the ears and muzzles before going back through with a damp finger and pressing down any points. 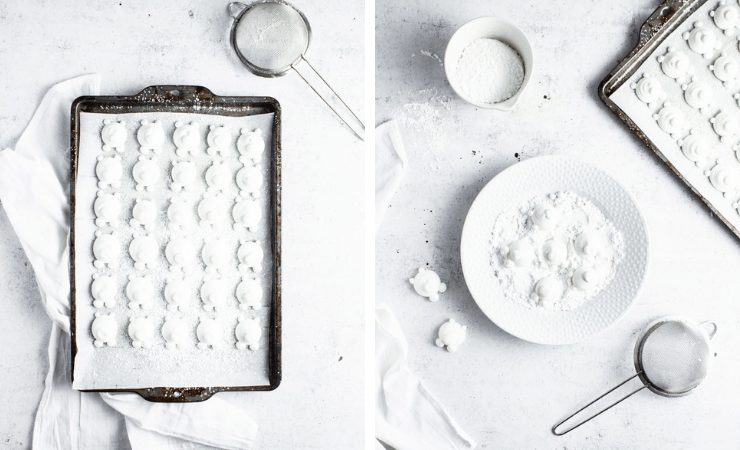 Allow the marshmallows to dry overnight (or at least 8 hours) before dusting them with a little sifted powdered sugar. To create the faces, use a black food pen to create the eyes and toes on the paws, and a brush with pink powdered food coloring for the ears and cheeks. Allow the food coloring to dry before packaging. Update Notes: This post was originally published in January of 2016 but was republished with step by step photos and tips in January of 2019. You’ll have to whip some up (or wait for us to be in the area and I’ll do it for you 😉 )! Honestly, I’m in love. Going to share these with every single person I meet today! These are so ridiculously cute! I think they are cuter than the cats and I <3 cats! I am definitely going to try making these; I adore cute!! 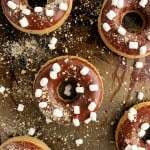 YUM – my nieces would love these, thanks Claire! Those are the cutest things I’ve seen all day. I want a marshmallow bear in my hot cocoa..
Amazing! I am so impressed with your bears. My kids are going to love them. Pinned! Yes they are the cutest! So we tried them today! You could have warned us HOW difficult it is :-)))) oh my dear! Once the kids pressed down the points of the head with their wet fingers the muzzle didn’t stick to the head any more….and it gets hard soooo quick :-/ i definetly need some practice! We decided to do next a cut out version 😉 we have miffy….. BUT thank you for getting us into it! We’ll try again! This is the cutest idea ever! Love these so much! Thank you Eden! 😀 I’m so glad you liked them! Thank you so much for this recipe, I’ve been obsessed with the Japanese version and I think this little bears are even cuter! <3 I tried to make them but the piping part is the hardest for me, I can't get the semi sphere shape for the body… Do you have any tips for me? cam I buy marshmallows melt them ans make the form using the mold? I think this is the cutest thing I’ve ever seen! SOOOOOO CUTE! I’ve made marshmallows before, but honestly have never even thought of making them into cute shapes like this! Lovely job! OMG HOW DID I MISS THESE. I was literally searching Pinterest for adorable marshmallows and this is exactly what I was looking for!!! Totally trying these. These are some of the most adorable things I’ve seen! Omgosh, I love them! Thanks so much for the awesome idea! Oh my goodness, these really ARE the cutest marshmallows ever. And I hear you about your inner thermostat getting messed up. Years ago, I lived in Ohio and I’ll never forget the day it was in the 20s and we all were outside having a picnic because it was so nice and “warm”. Wow. Hope you have a great day! These are just too cute! I’m into all things kawaii from Japan so I’m happy that you shared this. I made them last night, twice. (first time) They didn’t fluff up like yours and there’s air bubbles. The tiny air bubbles might be from the over beaten egg whites? Anyway they are still cute after I put their face on. I just wished that they look more like a fluffy marshmallow rather than a flat melted one. I LOVE THESE!!! 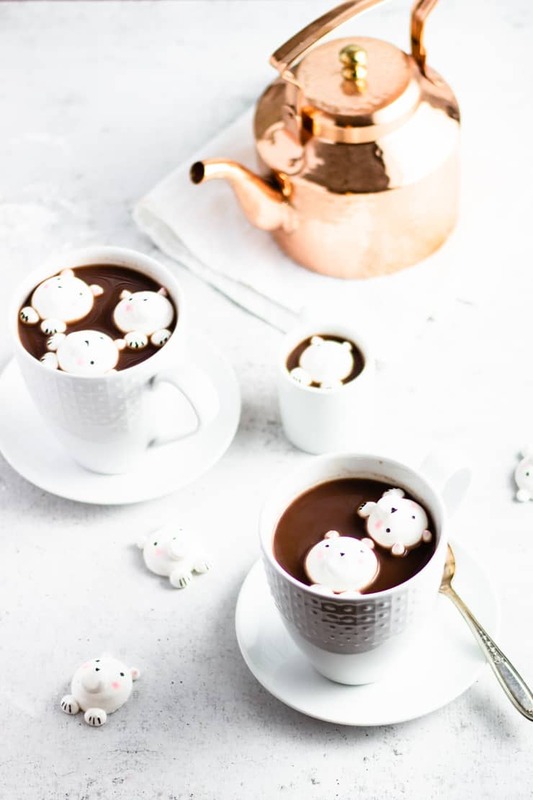 And your photos are amazing 🙂 Who wouldn’t feel special getting these in their hot chocolate?? These are definitely the cutest marshmallows ever!! I love how you painted the paws too. My kids would have fun with this. I have not made marshmallows in forever. Can’t wait to try this. Ahhhhh cuteness overload!!! Not only do I want to make my own marshmallows, but not definitely want to shape them into adorable little polar bears! My girls would freak out. Ah these remind me of photos my daughter would send me from Asia. Everything was so beautiful, attentive to detail. Your steps make these cute marsh-mellows wayy less intimidating. Thanks for sharing. 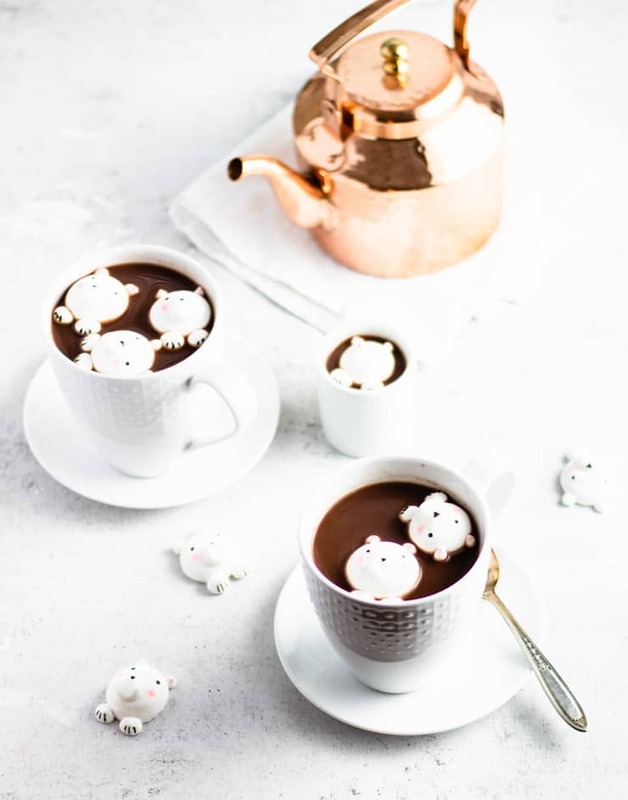 Such a great idea of homemade marshmallows to float in your cup of hot chocolate! These little bears are beyond adorable! I’ve just come back from Tokyo and there I had a beautiful cappuccino with Hello Kitty 3D. The most adorable thing! These are also super cute and adorable. Something I’d never be able to make myself, but love how they look. Those marshmallow bears are so cute!! I would want to preserve them just for their adorable level. If I still had little ones at home I’d be making them ASAP. But I do have grandsons who would find them gobbible. I’m anxious to try these out. Oh my goodness these are the most adorable marshmallows I have ever come across! My kids are going to love these 🙂 Never thought to make my own, but they sound so easy, how could I not? You absolutely could not be more right with the name of these – they really are THE cutest marshmallows I’ve ever seen! I never realized before now how simple it is to make marshmallows. This is a game changer. And gosh how cute are those bears?! SO CUTE!